St. Anna of Novgorod (whose name was Ingegerd until baptism) was the oldest daughter of the Swedish King St. Olaf Skötkonung, who reigned from 994-1022, and was known as a most Christian king. In 1008, the king, his family, and his personal bodyguard all received Holy Baptism. Ingegerd received an exceptional education for a woman of her time: she studied the Holy Scriptures, literature, and history. She was a true daughter of Scandinavia of the era of the Vikings and so from her earliest days, she enjoyed great freedom, took part in the public life of her homeland, traveled, received guests, and was a master of using arms. Historical sources especially make mention of her keen mind, her bravery, and her great influence on those around her. In 1017, Ingegerd’s father married her to someone who was “worthy of his friendship,” Great Prince Yaroslav the Wise (1019-1054). As a dowry, she brought the city of Aldeigjuborg (Old Lagoda) to Russia. She took the Orthodox name Irina. Once she became the Great Princess of Kiev, she used all of her strength of heart and soul, all of her gracious gifts, to serve her new homeland, and was a faithful helper and advisor to her husband in his affairs. Once, when a hired Norwegian guard rebelled and asked the Great Princess to be an intermediary between them and Yaroslav, she agreed, but warned them that she would defend her husband’s interests. When Mstislav Tmutorakansky, the Great Prince’s brother, rose up against him with his host, Irina challenged him to settle the argument by a duel with her. Mstislav, however, answered that he wasn’t used to fighting with women and he gave in to his brother. Irina had a lot of influence in establishing good relations with the countries of Northern Europe. She welcomed Edmund, Edwin, and Edward, the exiled sons of the English king, into Kiev, as well as Prince Magnus of Norway. He didn’t return home until the Great Princess was convinced that the Norwegians would give him his father’s throne and respect his rights. At this point in time, the government of Rus’ played a decisive role in the life of Europe, and its influence and authority were stronger than ever. This was in large part due to the work of the Great Princess. The reign of Yaroslav the Wise and Irina was the highest period of Kievan Rus. Yaroslav laid out plans to set up Kiev, his capital, as “a city of God,” an earthly reflection of the Heavenly Jerusalem (Rev. 2:10). The Church of St. Sophia became the center of Kiev. The entrance into this city of God’s Wisdom was through the Golden Gates, upon which a Church was built and dedicated to the Annunciation. Those who had recently been pagans now deeply venerated the All-holy Virgin, seeing her as the temple of God’s wisdom. 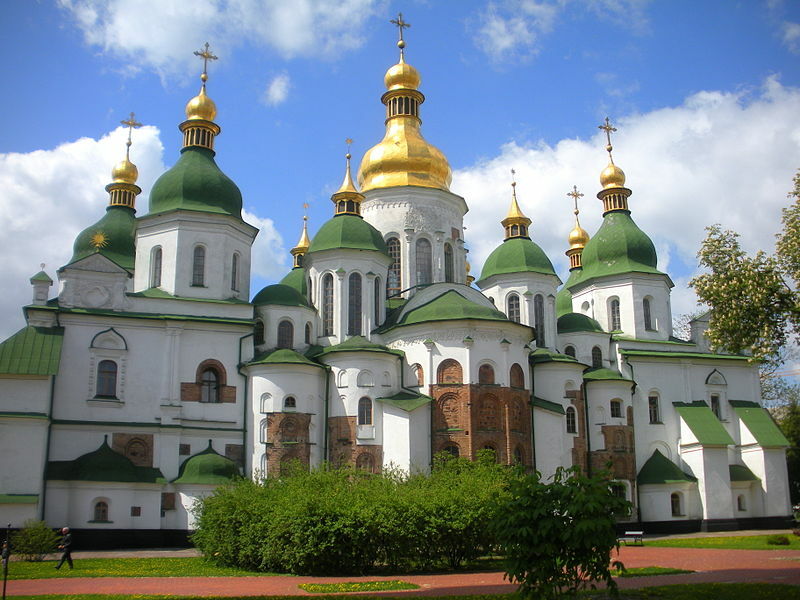 Because of this, the feast day of The Cathedral of St. Sophia in Kiev was the Nativity of the Theotokos. In 1051, Venerable Anthony of the Caves came from Mt. Athos to Kiev to found the Kiev Caves Lavra. Through him, the Mother of God blessed Kiev as her third earthly garden. Yaroslav the Wise strived to make Rus’ an organic part of worldwide Christendom. Churches were built throughout the Russian land. Greek singers began to teach the Russians Orthodox church music. It was during Yaroslav’s reign that the first Russian legal code, the “Russkaya Pravda,” was compiled and The Rudder, the book of Byzantine canon law, was translated. Yaroslav gathered books and manuscripts and had them translated from Greek into Slavonic. In order to spread literacy among the people, he asked the clergy to educate the children and he built a school in Novgorod. Within a very short period, the Kievan scribes had mastered the great literary riches of Byzantium. They also mastered the standard models of the Byzantine art of architecture and painting. No less important for the destiny of Rus’ was the inheritance left behind by Sts. Cyril and Methodios. “Now, the Slavic tribes shall fly,” said St. Cyril, prophetically pointing to the growth in importance of the Slavic peoples. From out of Bulgaria, which had a rich collection of Christian literature, Rus’ received an enormous collection of books. Most importantly, they received liturgical books in a language that was close and understandable. The Great Prince often had to travel on long campaigns and trips, during which time Irina stayed behind in Kiev, running his affairs. Irina gave birth to seven sons and three daughters. Her sons are especially noteworthy: the Holy Right-believing Prince Vladimir of Novgorod (†1042, commemorated on October 4th), Great Prince Izyaslav of Kiev, Sviatoslav of Chernigov, and Vsevolod of Pereyaslavets (the father of Vladimir Monomakh). Irina’s daughters, like their father, mother, and brothers, were raised in an atmosphere of literacy. An ancient chronicler relates that Yaroslav “sowed the words of books” in the hearts of the people close to him. The Great Princess taught her children her native language and they understood all the Scandinavian sagas well, which Varangian soldiers sang in the courtyard of the prince. The daughters of Irina and Yaroslav became queens: Anna became queen of France, Maria became queen of Hungary, and Elizabeth became queen of Norway. It is known that the Great Princess founded a monastery in Kiev in honor of her patron saint, the Great-martyr Irene. According to the custom of the time, as founder, she not only had to care for the monastery, but also run it herself. In 1045, she set out for Novgorod to her son Vladimir to lay the foundation of a cathedral named after the Wisdom of God. In Novgorod, the Great Princess took the monastic tonsure with the name Anna. This was the first monastic tonsure within the royal house. Afterwards, it became a tradition for Great Princes and Princesses to take the monastic tonsure after they had fulfilled their duty of governing the people. There in Novgorod, the holy princess Anna reposed on February 10th, 1051 and was buried in the Cathedral of St. Sophia. Shortly afterwards, the body of her son, Prince Vladimir of Novgorod was buried near her. The veneration of St. Anna and her son, St. Vladimir, was established after a sign that appeared to the archbishop of Novgorod, St. Euphemios (†1458, commemorated on March 11th) in 1439. In conjunction with this sign, he also established the church-wide commemoration of the holy hierarchs of Novgorod, who were buried in the Cathedral of St. Sophia. The Holy Equal-to-the-Apostles Olga and Venerable Anna of Novgorod, standing at the beginning of Russian feminine holiness, open up for us two different paths of service: spiritual and earthly motherhood. Both of these paths are under the favorable protection of the Most-holy Theotokos. The first woman, Eve, whose name means life, is called in the Bible, “the mother of all the living,” (Gen 3:20), but she received that name only after the fall into sin. The Holy Fathers say that this glorious name was spoken prophetically about the second Eve, the Most-holy Virgin, who gave birth to Life Himself, the Creator and Savior of the World, and who thus became “Mother of all the living.” The fullness of divine love is hidden within the secret of Her motherhood. In Her person, woman was exalted in the sight of all the world, visible and invisible. Christianity deeply values women as mothers. Motherhood transfigures human love and unites mankind to the mystery of the birth of a life that is created for eternity, joy, and beauty. By being a mother, a woman becomes the protector of her family and the family hearth. The inner life and stability of her family depend on her gentleness, care, patience, and self-sacrificing service. Women have one of the highest and most glorious tasks – raising new citizens of the Heavenly Kingdom. The Great Princess Irina was this sort of mother. The spiritual succession of Sts. Olga and Anna is significant. St. Olga the Equal-to-the-Apostles made the Church of St. Sophia in Kiev the chief church of Kievan Rus’. 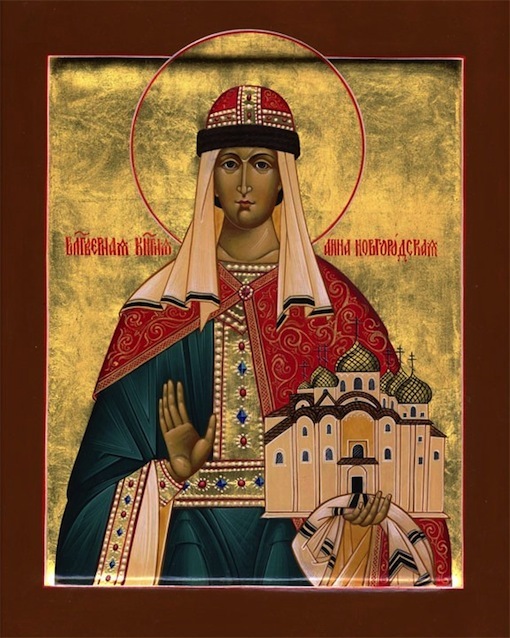 St. Anna of Novgorod took part in laying the foundation and building the church of St. Sophia in Novgorod and became the protector of that church, because her holy relics were displayed there openly for veneration. In that way, St. Olga and Venerable Anna strengthen the spiritual richness of Ancient Rus’, uniting her two chief spiritual centers: Kiev and Novgorod. Venerable Anna of Novgorod was the first to unite the two different paths of holiness – that of the holy right-believing princesses, and that of the venerable monastics. She united active service to the world and prayerful contemplation, the monastic ascetic struggle. The family life in ancient Russia was based on a strict piety, a daily prayer rule, the reading of the Scriptures, the Psalter, and the lives of the saints, and church attendance. More than anything else, the family is a domestic church. Monastic asceticism served as a spiritual ideal for the Russian faithful. And many Russians desired the monastic life, seeing it as the crown of their path in life. The right-believing princesses of Rus’, once they were widowed, never got married a second time, although the Church does not forbid a second marriage. By taking the monastic tonsure instead, they betrothed themselves to the Heavenly Bridegroom, which became the path that seemed most ideal for the life of a widow. Because of that, the tonsuring of widowed princesses and noblewomen almost became the norm. The Church crowned those who had successfully completed married life with the monastic tonsure. Thus the princesses who became nuns gave the Russian people an example of a worthy fulfilling of the principle of one marriage only. The special nature of Venerable Anna’s path can be seen in her heritage. She was the daughter of a different people and yet she labored to help to create Holy Rus’ and she stands together with St. Olga at the start of the ladder of Russian feminine holiness. Venerable Anna made what was foreign into something that was her own without distinction, creating unity among the human race. In the northern countries, they called her the “Holy Queen Irina.” Among the women saints of those peoples, she shone as the first, and became a heavenly protector and intercessor for them. Ingegerd’s spiritual work was exemplified by the name she received in Russia, for Irina means peace. In the example of St. Anna of Novgorod, we see the sources of the many different paths of spiritual labor open to Orthodox women. Her spiritual aid is especially necessary now. This venerable saint is a bright and creative example of a human person and because of that she’s able to help others choose their paths. Her whole life was one of service to the Theotokos, whose gracious gifts were granted unto the saint and gave her the joy of motherhood. That is why this saint is such a bold intercessor before the Panagia. Her other name, Anna, that was given to her when she became a nun, means “grace,” and it points to that unique power that helps us to attain holiness by God’s grace. In 1991, a municipal museum returned St. Anna’s relics to the Church along with another of the Church’s treasures: the wonder-working icon of the Theotokos of the Sign. During times of terrible dangers for their city, the people of Novgorod have always turned to the Mother of God for her help, protection, and for ending civil strife and after their prayers, the Mother of the Lord has always guarded her beloved city from misfortune. Together with this, the relics of Novgorod’s heavenly intercessor, St. Anna of Novgorod, returned and are now openly venerated in the Novgorod church of the Holy Apostle Philip, where they give gracious help and spiritual joy in our troubled times. A relic of St. Anna was transferred to the Orthodox Church in Eskilstuna, Sweden in 2008. After 1,000 years, St. Anna returned to her ancient homeland. She was the first canonized Swedish saint, and is now hailed as the heavenly patron saint of Sweden. O glorious Anna, the Orthodox peoples of Sweden and Russia praise thy name in their every generation, for, inclining thine ear to thy royal sire, thou didst leave thine own people and thy father’s house, and didst go with gladness and rejoicing unto the Russian land, where the prince, delighting in thy great beauty and wisdom, took thee to wife, and thou didst bear for him and his dominion godly offspring, with whom thou standest now in paradise before the throne of the Most High, arrayed in the Christian virtues as in vesture of inwoven gold, making earnest supplication and entreaty in behalf of all who honour thee with faith and love. The Mother of God herself said this when she appeared to the 19th century ascetic, the nun Alexandra Melgunova, and said: “I brought my servant Anthony from my garden on Athos, my holy mountain, so that he could make me a new garden in Kiev.” According to Church Tradition, the Theotokos’ first earthly garden is the holy mountain, Athos, her second garden is Georgia, her third, Kiev (in the epoch of the flowering of Kievan Rus) and her fourth the Diveyevo Convent. Trans: Sts. Cyril and Methodios were Greek missionaries from Thessaloniki who evangelized the Slavic tribes in Bulgaria and Moravia. They and their disciples developed an alphabet for the Slavs, translating the Holy Scriptures and the liturgical services of the Church into their common language, 200 years before the reign of Yaroslav and Irina. This language became the basis of Church Slavonic, the common liturgical language of many Slavic peoples up until the present. Later on in Russian history, Great Princesses actively taking part in government business became traditional. Trans: The Varangians were a Scandinavian tribe who, according to ancient chronicles, had helped to found the Kievan state and whose culture mixed with that of the local Slavic people. Connections between the Scandinavian and Kievan Slavic tribes continued for several hundred years. Russian chronicles say, “Where St. Sophia’s Cathedral is, there is Novgorod.” The Church of St. Sophia became a symbol of Novgorod and an icon of St. Sophia became a traditional gift of bishops of Novgorod. This text was translated by Fr. John Hogg. A few end notes were added by Fr. Andreas Blom. What an amazing and glorious saint we have to venerate. I did not know of her holy life and was very inspired by her courage and compassion. May she ever remain an inspiration for all women, young or old. Thank you for bringing the knowledge of her to us, Father Andreas. And may your precious daugher follow in her footsteps of piety, strength and love. Yes, St. Anna is indeed a beautiful Saint, and an example for us all to follow. Someone just donated a nice icon of her for the church. She is now next to Tsarina Alexandra, and opposite to her is he father-in-law, Great-prince Vladimir. I am a direct descendant of St Anna and Yaroslav. I thank God for my heritage…and for her life.